I LOVE these books! You have to read them! They’re one of my favorites! I loved the Emily Windsnap series!!! I think this is the best book in my life, seriously. Loved all the romance, underwater adventures and magic! It made ME believe that mermaids and magic real, and really…I just can’t wait for the book. After I finished the last book in the Emily Windsnap series, I was crying all night long in bed because it was just soooo good! I wish this series could be continued, and now I’m onto reading Liz Kessler’s other books. I still can’t believe that the Emily Windsnap series isn’t popular, probably because it only just came out. 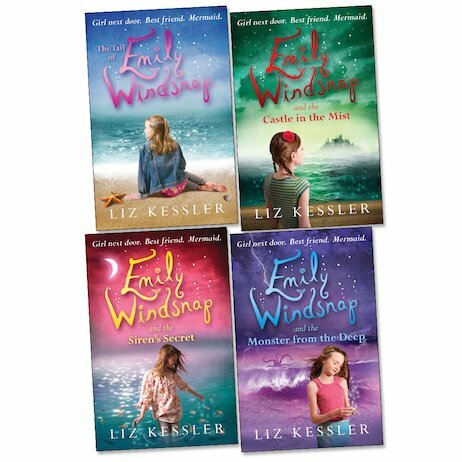 But I think Liz Kessler is by far my favourite autor, and the Emily Windsnap series are the best books she’s writen so far. I LOVE THIS BOOK!!! YOU HAVE GOT TO READ IT NO EXCEPTIONS!!! mermaids are the best. emily was my idol for a bit wjen i was 11! It was great, the idea was brilliant as were the descriptions. The action features,though, did lack certain details. However, Liz Kessler did the best in writing realistic actions and reactions. I liked a lot when I read it and so did my friends, I highly recommend the book. I have read two of the books that I borrowed from the library and I thought that they were fantastic! I just hope I get number 2 and 4 for my birthday!!! I loved these books! I got them for Christmas from my aunty, and enjoyed every moment of reading them. I would highly recommend this book to any girl aged 9 – 15! i really want these books!!!!!!!!!!!!! !